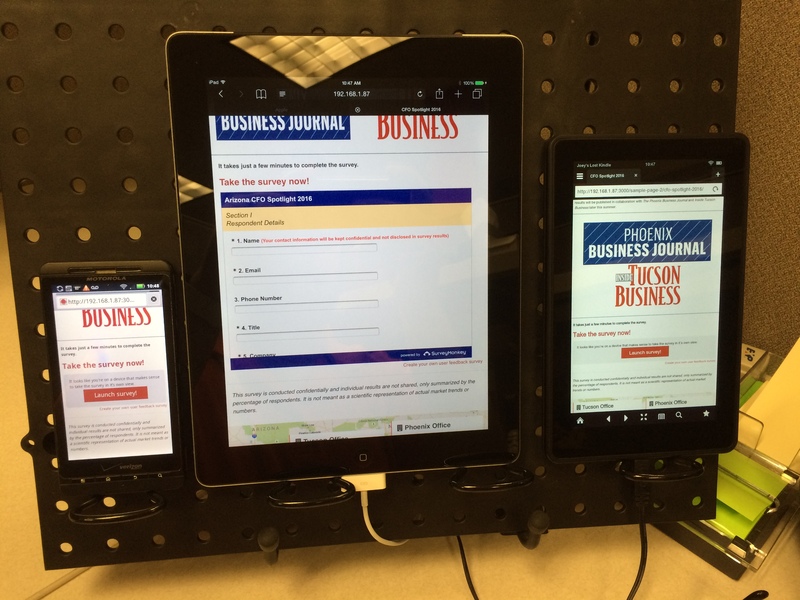 TL;DR — I’m a web developer nerd that wanted to test my sites on multiple devices at once. So, I built a thing to do that. I’m the in-house web developer at an excellent CPA firm in Southern Arizona. I build/maintain all their web properties – internal and external. As it stands, all but our main site are responsive and feel modern-enough1. Our main site is based on a non-responsive WordPress theme I chose (D’oh!) in 2010 that’s been heavily customized over the years2. It needs a major responsive redesign – yesterday! Based on other job responsibilities/projects, I haven’t had time to focus on it until now. 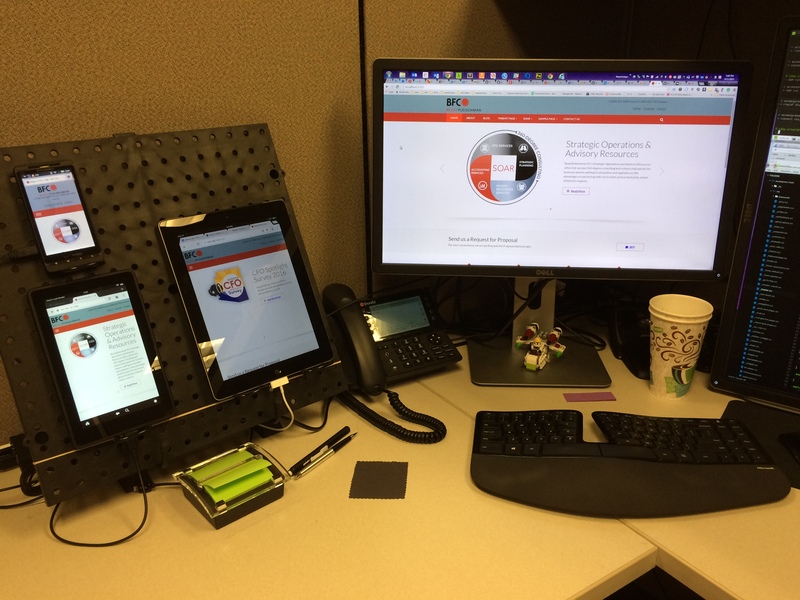 As I really started to stare the project down, I started to wonder how I’d make sure the new theme looked right across multiple devices. Use what you can! Perhaps you own an Android phone… Tell your friends what you’re doing and ask if you can borrow a previous-model iPhone that they’re not using or something. I’m hoping to get my hands on a newer Android device or two – especially if they’re different screen sizes. I’m debating whether or not to send an email to the firm asking folks to donate a dusty device or two. Thankfully, in this day and age, we’re able to hop on the internet and look up how other folks have solved similar problems. After poking around the web, I found a cool project/movement called Open Device Lab. It aims to highlight device labs that are open to public use for free and encourage the creation of more. It’s certainly a very cool idea; one that I think could be a really cool addition to any of the co-working locations in downtown Tucson. However, it’s an idea I don’t think I can pitch w/o having a working example to demo. I’m just gonna leave this here and say, yeah… looks really nice. Guitar Hero guitar stand – embarrassing, but it works well. Note: If you anticipate needing to test more than 4-5 devices, you may want to double up on these items. The beauty of the pegboard used in this build is that it’s designed as an expandable system. Two of them will lock together really nicely with a couple screws. There are two pieces of software magic that make this setup work beautifully. You can certainly pull off this setup with any local web server stack (MAMP, LAMP, XAMPP, VVV) or with ServerPress’ free version, DesktopServer Limited, however, I want to point out that after using that version for a few hours one day a couple months ago, it was enough to convince me to upgrade to their fully-featured DesktopServer Premium version. I have not been disappointed. DesktopServer allows you to quickly and easily generate optimized WordPress projects that run locally. ServerPress has done a great job putting together a software package for Mac or Windows that lets you run a local version of your sites quickly, with very little fuss. For more information on how DesktopServer can exceed your needs, hit their YouTube channel! If DesktopServer is the cake, BrowserSync is the frosting. It allows you to inject live-updating code into your pages and then sync scrolling, mouse clicks, and form input across any browsers viewing the URL on the same network. No more saving your code, switching to each browser you’re testing in, and refreshing the page. It refreshes each connected browser automatically. It’s free, open source, and ridiculously wonderful. I’ve got it hooked into my Gulp build process. PHP, JS, and SCSS files are watched, compiled/concated on-save, and all connected browsers are refreshed w/ the latest changes. Obviously, the goofy Guitar Hero stand needs to be replaced by a sturdy solution of some sort. It does the job for now, but I’ve already spent some time sketching out some ideas for a wooden frame (with room for two panels mounted together – I went ahead and bought another one :)). For now, version 1 works really well for me. I’ll definitely add photos of version 2 when it gets to that point. Perhaps that’ll be one I can replicate down at CoLab Workspace or Connect Co-working?